Many cultures create a mythology to help explain the workings of the world. Western civilization is most familiar with the gods and goddesses of Greek and Roman mythology, who have comparable powers, but different names. And, mythology is created often in response to human history, so a historical timeline can be a good reference to have. The predominant mythologies handed down through the ages are those of the Greeks and Romans. The Greek mythology names and the Roman mythology names of each culture include gods and goddesses who interacted with humans, with good, bad, and indifferent motives. 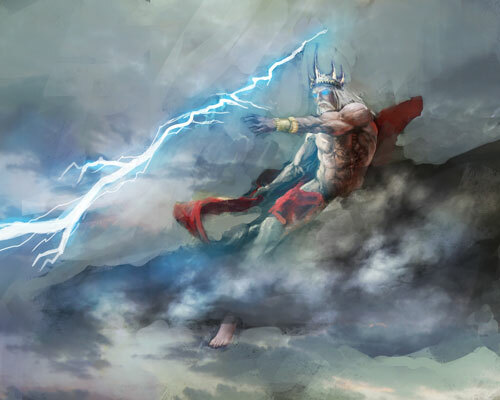 Zeus (a Greek god) is depicted here throwing lightning. However, the Romans would assume this was a depiction of Jupiter, the king of gods. Besides the gods and goddesses named here there were many other gods and immortals in Greek mythology. The Greek mythology names of other gods include the goat-god Pan; Rhea, Cronos’s sister and the mother of his children; Heracles, the son of a mortal and Zeus who had to earn his immortality; Ganymede, a beautiful prince that Zeus brought to Olympus to be his cup-bearer; and the four winds: Zephyrus, Eurus, Notus, and Boreas. Like the Christian god, Jehovah, Zeus/Jupiter was considered the all-mighty father, but instead of being the father of man, he was the father of the lesser gods. Zeus actually was a third-generation god. So, who were the first- and second-generation gods? Glad you asked. Gaia was the first goddess, also known as Mother Earth, and gave birth (with her son Uranus being the father) to the second-generation Titans. The Titans were led by Cronos or Saturn, and he seized power from Uranus. Zeus, Poseidon, and Hades are the sons of Cronos, and Zeus was considered primarily responsible for overthrowing his father. Hera/Juno was his mate, although not the mother of all of his children. Zeus, Hera, and the other third-generation gods of Ancient Greece were Olympians; that is, they lived at the top of Mount Olympus, the highest peak in Ancient Greece, or a heaven in the skies. Sometimes, these gods intermingled with mortals, even falling in love and bearing children with mortal men and women. Although modern man views these Greek gods and goddesses as creatures of mythology, remember that to the ancient Greeks, they were no less real than current beliefs in God or Buddha. With the passage of time, modern society has come to view the stories of the gods as metaphors for teaching lessons about behaviors and actions, although the gods and goddesses in Greek and Roman mythology exhibited many of the weaknesses and pettiness that modern man would never associate with deities. One lesson that the Greek myths loved to teach was the lesson of hubris, or pride. Whenever a mortal (or god) exhibited hubris, thinking he or she was better than the gods, they inevitably would also experience a resulting tragedy. If one of the lesser gods started thinking he was more powerful than Zeus, then he, too, would be knocked down a peg or two. This type of metaphorical lesson continues in the stories of the Bible, Shakespearian tragedies, and even into modern literature and art. Of course, the stories of these ancient gods were not just provided as a way to guide the behavior of men. Many of the myths explain various aspects of the world. Of course, there’s a story about how the world was created, but there are also stories to explain things such as the changing of the seasons. Persephone or Proserpine (Zeus and Demeter’s daughter in Greek mythology and Jupiter and Ceres’s daughter in Roman mythology) was stolen by Hades or Pluto to be his queen in the underworld. Her mother, the earth goddess, was saddened by her loss and refused to fulfill her duties. A compromise was reached whereby Persephone would spend 4–6 months (depending on the version of the myth) with her mother, and the rest of the year in the underworld. Thus, when she is with Hades, the earth goddess refuses to fulfill her duties, resulting in fall and winter, but Persephone returns, resulting in spring and summer. Every religion has a creation “myth,” although those who currently practice a religion would argue that it isn’t myth. Christianity has the story of God created the Heavens and the Earth, and the story of the first man and woman in the Garden of Eden. The Greeks actually had several creation myths including one involving an egg from which all planets, the Earth, and all creatures hatched. It is interesting to note some other parallels. For example, Eve, the first woman in Christianity, was tempted into sin by the serpent and ate from the tree of knowledge of good and evil. As a punishment, Adam and Eve are kicked out of the garden of Eden where they had everything they desired. In Greek mythology, the first woman is Pandora. Ring a bell? Pandora is tempted to open a forbidden box (jar in some versions) and brings chaos by releasing all the ills of the world. The first humans were destroyed in a great flood sent by Zeus. The only survivors were one man, Deucalion, and his wife. Of course, this parallels the story of Noah and his ark. Mount Olympus itself is often considered to be the Ancient Greek’s version of Heaven, and Hades, named for the god who ruled the underworld, is the equivalent of the Christian’s Hell. Interested in other culture’s mythologies? Mythology seeks to explain the world and thus reflects the culture, events, and history of the societies that create the stories handed down as myths. Egypt’s Nile River and its cycle of overflowing its banks leaving fertile ground as it receded became the basis for Egyptian religion that demanded that the people help the gods prevent anything from interfering with the cycle. Myths form around the founding of cities, including Athens and Rome — about 10,000 to 2,500 years ago, respectively — and the founding of civilizations, including the creation myths passed down in virtually every culture. Chinese and Native American myths account for astrological occurrences as well as for more earth-bound events such as the Toltec invasion of the Mexican city of Teotihuacan in 900 CE. The myth of Quetzalcoatl, the feathered serpent, grew from this victory. Famous poems, such as Beowulf and the Saga of the Volsungs are combinations of history and legend. The stories of the mythical Br’er Rabbit, who won every encounter despite his subservient position, inspired hope in African-American slaves in the Civil War era. And don’t assume that all the myths are hundreds, if not thousands, of years old. The mythical city of Brigadoon, a Scottish village that appears once every hundred years was essentially the invention of Alan Jay Lerner and Frederick Loewe who wrote a play in 1947. The following table offers historical highlights from 3,000 years before the common era to the eve of the 20th century. by the Roman governor Pontius Pilate. Asia Minor, and Greece. Christianity separates from Judaism.